Kronosaurus was the largest marine reptile that ever lived. It belonged to the category of plesiosaur, which is a meat-eating reptile. As considered by most of us, Kronosaurus is not a dinosaur, it is a plesiosaur. It was known to have been lived in the early cretaceous period and it belonged to the Dolichorhynchopidae family. It is known to have been lived around 110 million years ago. The term Kronosaurus was derived from the Greek word and the meaning of the term is krono’s lizard. Kronos was known to be the Greek god of time, who is known to have eaten his own children for the purpose of guarding his powers. The term Kronosaurus is pronounced as crow-no-sore-us. Kronosaurus is known to have been lived in the country of Australia and it was a highly skilled swimmer. Apart from Australia , these plesiosaurs would have been lived in South America and Columbia as well. The fossils of Kronosaurus were found in Queensland , Australia in the year 1889 and it was found by A. Crombie. It was named in the year 1924 by Longman. Kronosaurus were known to be the ferocious predators of the sea and it would have been lived in the open oceans, but would have also required swimming to the surface since it was an air breathing reptile. They might have been able to move a little in the land like seals. From the fossils of Kronosaurus, it was found that it would have got a pointed tail, short neck with four long flippers and a huge head. It has a rounded teeth and strong jaws and tooth of the Kronosaurus was so strong that it would easily crush the shells. The four paddle-like flippers had enabled the Kronosaurus to move around water like sea turtles. 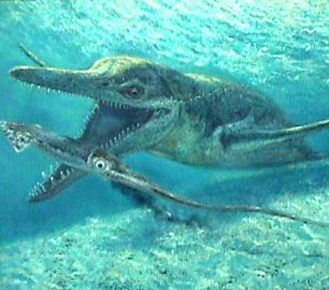 The diet of these plesiosaurs was large squids, ichthyosaurs and sharks. It was known to have been around 30 feet (i.e.) 9m long. The head of Kronosaurus alone was around 9 feet (i.e.) 1/3 rd of the total body length. It has been found that it would have been weighed around seven tons. Even though, the Kronosaurus were known to have been lived in oceans, it would have swim to the surface for laying eggs as is being done by turtles nowadays. Like turtles, Kronosaurus has also laid eggs in nests dug in the sand. According to a research Kronosaurus made its living just like the present day shark in such a way that it had eaten every all animals living in the water coming in its way. It has been found that it did not restrict itself in eating just squids and fish, but feasted occasionally with other aquatic reptiles as well. From the fossils of Kronosaurus, researchers have found some stones in their stomach and they assumed that these stones might have been consumed by the Kronosaurus for grinding up their food or the stone might have also been used as ballast for the purpose of diving. Hope, you might have got the required information regarding Kronosaurus.